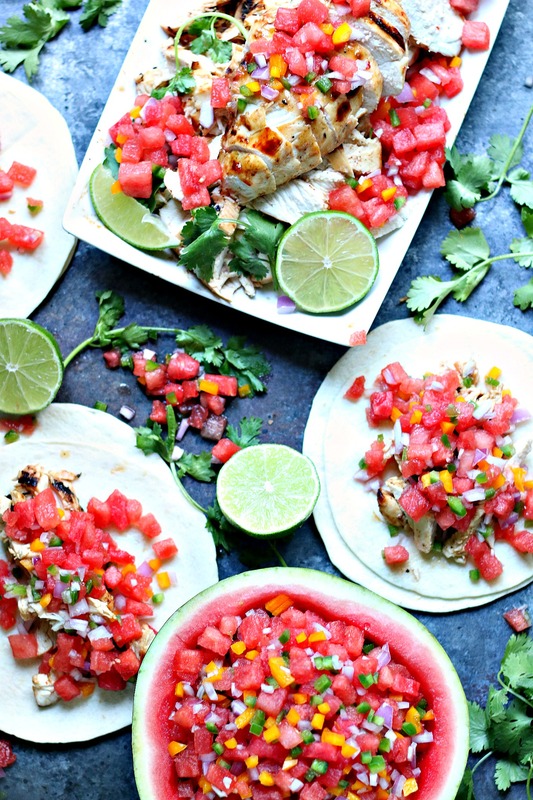 These Honey Lime Chicken Tacos with Watermelon Salsa are incredibly easy to make. 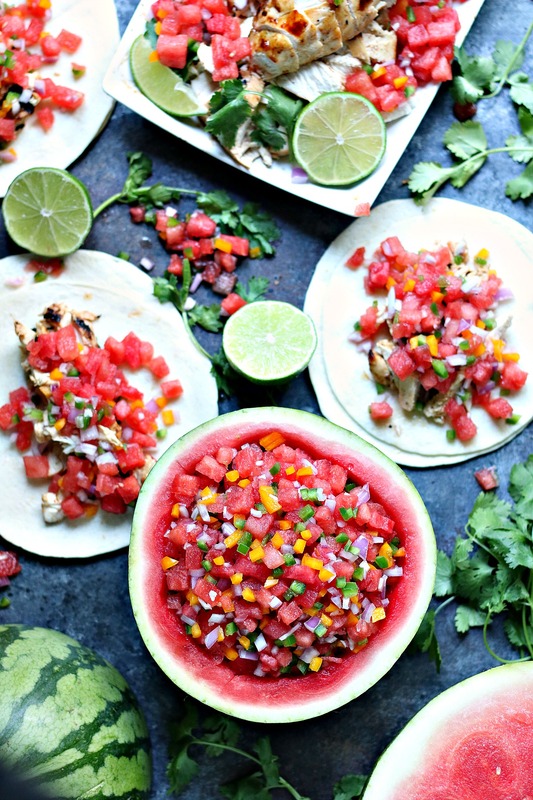 The chicken is grilled to perfection then made into tacos topped with a simple watermelon salsa. This post is sponsored by the National Watermelon Promotion Board. All opinions are my own. Thanks to all the companies, and readers, who help support Cravings of a Lunatic. Watermelon is the quintessential summer fruit and for most of the summer, we get our watermelon from the Southern U.S. because Canadians love watermelon! This girl loves her tacos. She also LOVES watermelon. I cannot help myself. That first bite each summer is heavenly. Honestly, I could eat an entire watermelon every single day. I’m going to be honest, I will find any excuse to eat watermelon every single day. Whether it’s a savoury recipe or a sweet recipe, or something in between. I crave them all. Most days I’m likely to just slice one open and grab a spoon. 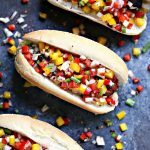 Other days I love getting creative by mixing sweet and savoury flavours together in recipes like this one. There is something about topping meat with fruit that just brings me to my happy place. 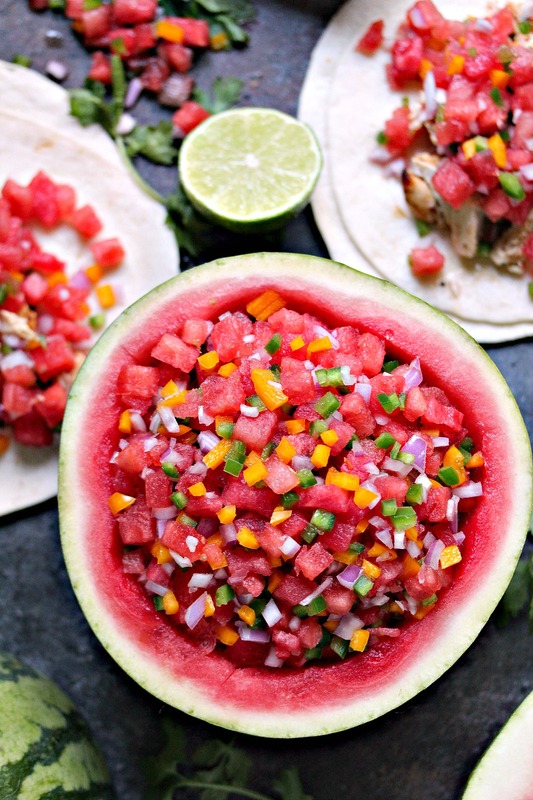 Watermelon salsa goes perfectly with most meats, everything from beef to chicken. 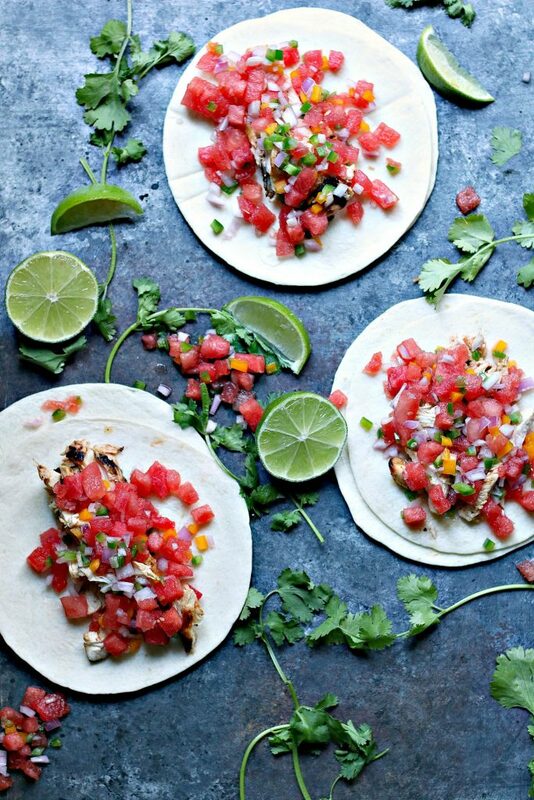 For this recipe, I paired easy chicken tacos with a simple watermelon salsa. The combination is sheer perfection. I added a bit of heat plus a little extra sweet. It’s how I roll. You can tone down the spice if you like a more mild salsa. The fun thing about a recipe like this is you can adapt it to your own taste. Use what you like, exclude what you don’t like. Use good quality thick boneless skinless chicken breast for this recipe. We’ve tried the thin boneless skinless chicken breast on the grill and the results were not good. Trust me! I cook mine over direct heat on the grill but you could use indirect heat and cook them longer. Not everyone is comfortable grilling over direct heat. If you do, please pay close attention! I highly recommend you use the salsa the same day you make it. The recipe uses limes which can break down the salsa over time. Limes are acidic so add them right before you serve. When you make this be sure to make extra. These chicken tacos will fly off the platter. We make extra tacos and extra salsa. Garnishes are optional but encouraged. Be sure to check out the National Watermelon Promotion Board for more great watermelon recipes! Follow the hashtag #EatMoreWatermelon all summer long! Combine watermelon, shallots, Jalapeno peppers, red onion, pepper, sugar, and lime juice in a large bowl. Stir to combine ingredients thoroughly. Place in fridge for 1 to 2 hours before serving. Salsa is best used the day you make it. You can add extras before serving, to taste. Oil grill grates before grilling. In a small bowl combine olive oil, lime juice, honey, garlic powder, chili powder, salt, and pepper. Stir until combined. Add chicken and marinade to a resealable Ziploc bag. Shake and allow to marinate for 15 o 20 minutes. Remove and discard excess liquid. Place chicken on grill grates. Cook on for 4 to 5 minutes, depending on the thickness of your chicken breasts. Then flip and cook on other side for another 4 o 5 minutes. For this recipe I recommend thick boneless skinless chicken breast. I cook mine over direct heat between 375 and 400 degrees F. One side of my grill is direct heat which is the side I cook the chicken on. I also have the other side of the grill set for indirect heat in case I want to move the chicken breast at any point to slow the process or reduce flare ups. Cook until desired doneness. Follow same guidelines if cooking in the oven. Remove from grill and place chicken breasts on a platter. Brush on sweet chili sauce while the chicken is still hot. Allow to rest for a few minutes, then slice the chicken into thin strips. Heat tortillas in foil on the grill while the chicken rests. It only takes a few minutes with the lid down to warm tortillas. Remove carefully and transfer to a plate. 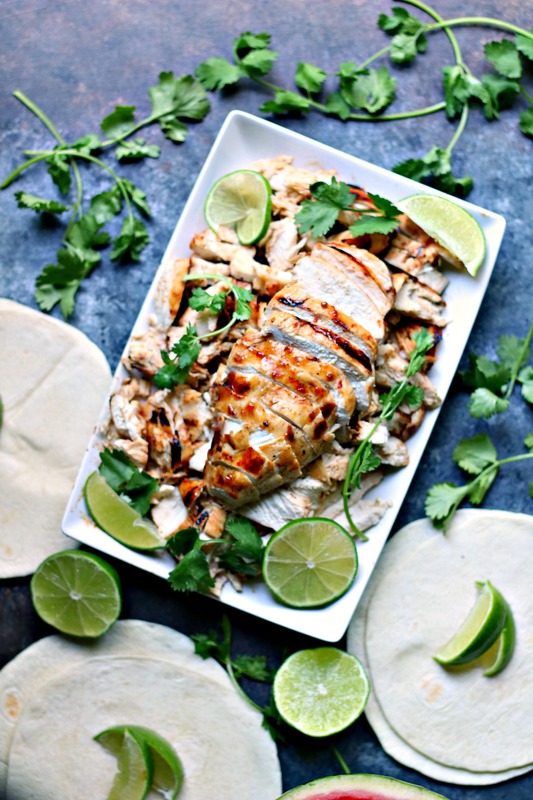 Pile chicken on tortillas. 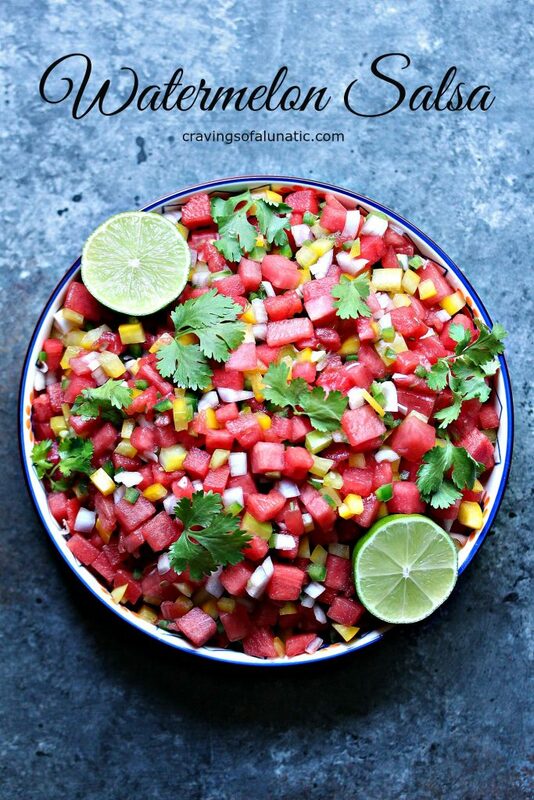 Top with watermelon salsa. Add any extras you may like. Serve with a big old watermelon loving smile! Recipe is cooked on the grill but can be cooked in the oven as well. You could also pan fry the chicken breasts, if desired. What’s your favourite way to enjoy watermelon? I love watermelon salsa. In the summer, it’s an instant cool down on a beastly hot day. with these tacos, I’ll bet it’s wonderful. 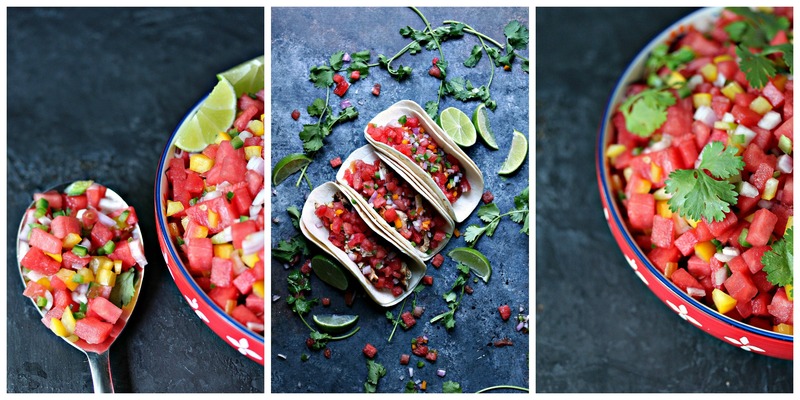 Watermelon salsa sounds amazing for so many things! that is a taco salsa that I would go crazy over! It totally screams summer to me! This watermelon salsa sounds perfect on this! I love putting fresh fruit salsas on my tacos… it just makes them feel extra-summery, somehow. 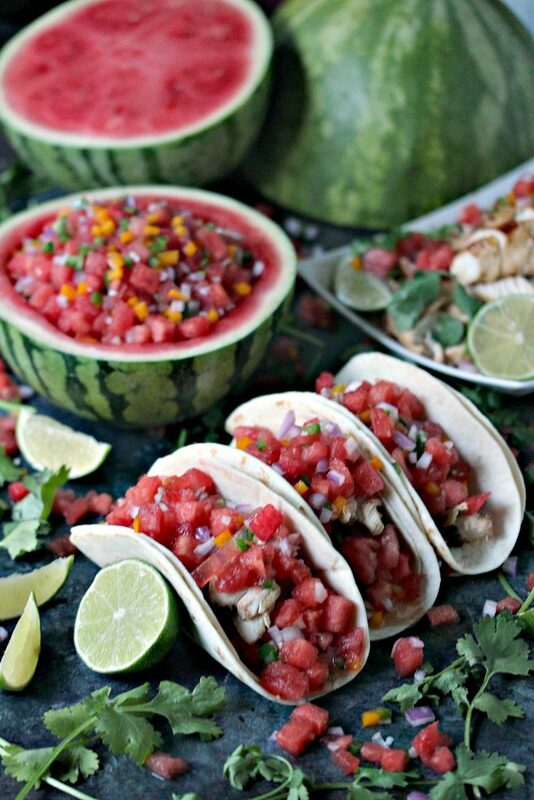 I’ve never thought to use watermelon as my salsa base, but now I’m wondering why I’ve waited this long, because it looks ah-mah-ZING. Never made such a salsa. Looks great and makes me do it this weekend. Thank you so much ! 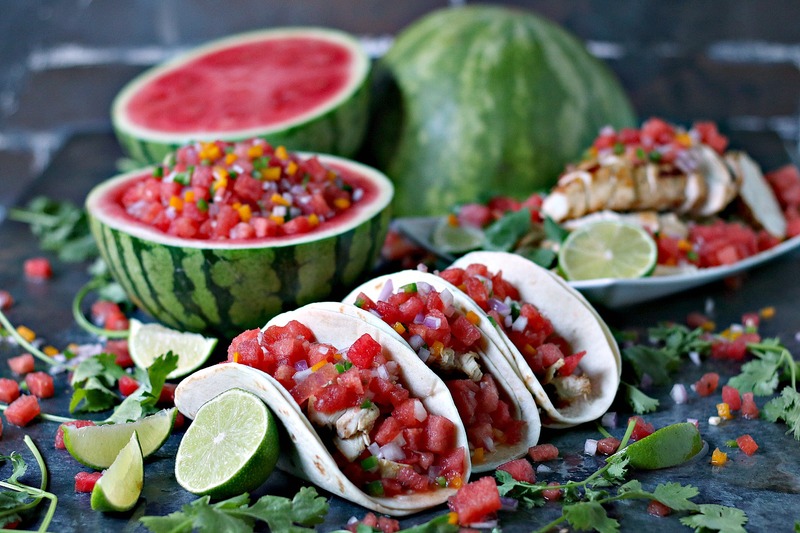 I love fruit salsa…how have I never tried watermelon salsa!? 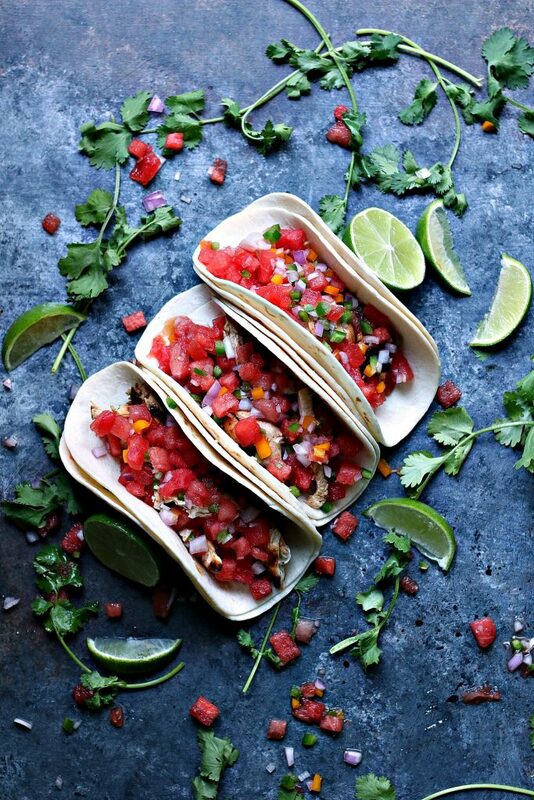 I also love the combo of honey and lime, so I am allllll over these tacos! 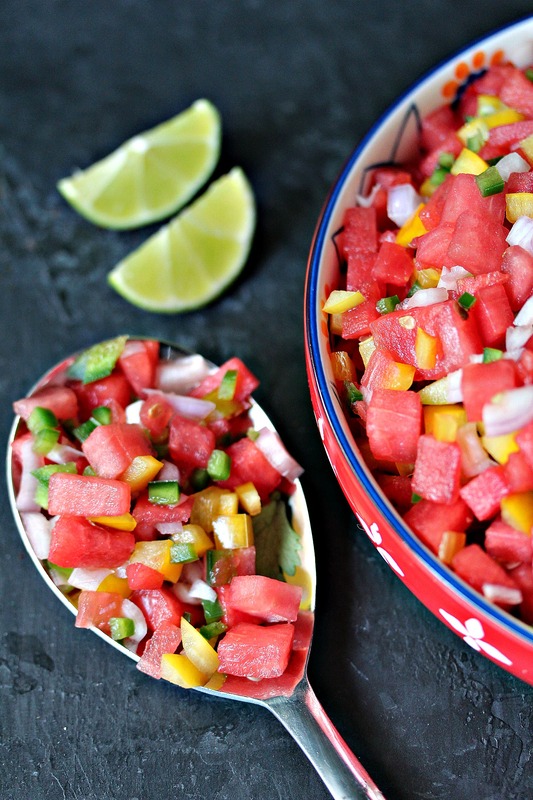 Fresh watermelon salsa is one of the very best things about summer! This rendition looks wonderful! These look so good! yes please! So beautiful! This meal is perfect for summer. Ooooh, these look great! I’m dying to try that watermelon salsa!! This recipe has been haunting me like a ghost. I’m finally ready to break the curse and make it! Ha, I love you comment, Ray. Let me know how it turns out.